We're guests of an exclusive small lodge -- the unique Silver Salmon Creek Lodge -- catering to small groups and accessible only by plane, and the bears are right in the area, so our shooting opportunities are maximized. Then--as difficult as it is to tear ourselves away from the bears--we'll take boat trips out to photograph both Tufted and Horned Puffins. This is truly a special treat, as we will be there about the only time of year that there are bears and perching Puffins to photograph. We'll have ample opportunity to work on both flight shots of the Puffins and "posed" shots from our tripods of them standing outside their burrows or returning from their fishing trips. I'll be shooting with you the entire week. The trip is limited to six photographers, so we'll have plenty of time to work together. Each evening we'll talk about the next day's shooting and cover shooting strategies for making the most of it. We'll also review our shooting each day and discuss what worked and didn't work. I'll be happy to answer any questions you might have. I can't guarantee that you'll get world class images, but I'll work to make sure you have the best possible chance! And of course we'll have plenty of exotic Alaskan scenery to photograph. From brilliant sunrises to eye-popping Lupin and Fireweed fields on the mountains there will be something for everyone. We'll also almost certainly get some chances to photograph Bald Eagles and a variety of other birds. 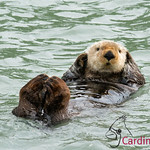 If we're lucky, on our way to the Puffin rookery we'll get to photograph a sea otter, like this one that's been hanging out there for several years. Both film & digital shooters are welcome. If you need help selecting or renting equipment, let us know and we can assist you. All participants will also receive a detailed package with plenty of information on how to prepare, what to bring, and how to safely photograph the bears and puffins. Top of the line Pro Instruction! Wildlife Photo Instruction: All participants will have plenty of 1-1 personal instruction time while we're in the field on game drives. We'll also have focused sessions on taking great scenics, including panoramas. Classroom Photo Instruction: As always, we will have a projector and screen with us and will be providing photo instruction in digital workflow and image editing and image enhancement using Photoshop. See what our participants have accomplished! If you've had your fill of photography, we're in one of the world's foremost Salmon fishing spots. Yards from the Lodge is world class Salmon fishing and at low tide the beach has an abundance of Razor Clams to dig for. 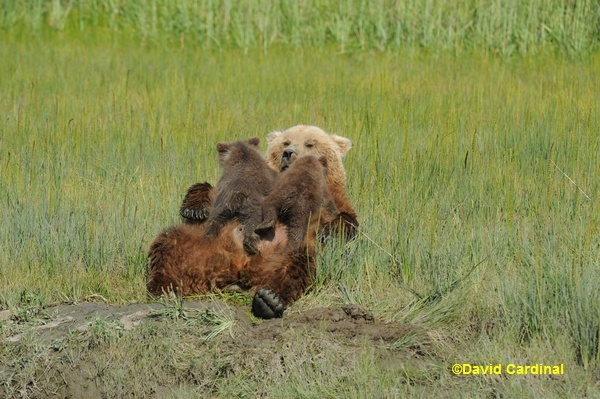 Clamming and fishing also provide some excellent opportunities for bear photography, so you'll always want to have a camera along. 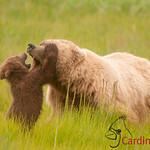 We'll once again have two photo safari sessions, July 9th to 15th and July 14th to 21st . We've made the sessions two different lengths (5 nights at the Lodge and 6 nights at the Lodge to allow for flexibility in peoples' schedules and budgets) Accommodations will be at the world class Silver Salmon Creek Lodge with three home-cooked meals each day (the lodge features a chef and a baker, and seldom has more than fifteen guests) and nice rooms. Since we're right in the middle of the bear rich coastal plain we couldn't be any closer to the bears, so we'll have all the time we want to photograph them. The Lodge has a boat and captain who will take us out to a Seabird Rookery featuring Common Murres, Horned and Tufted Puffins and Kittiwakes, as well as Auklets and Oystercatchers. Bald Eagles are seen almost continually, and we can often get fairly good shots of them. 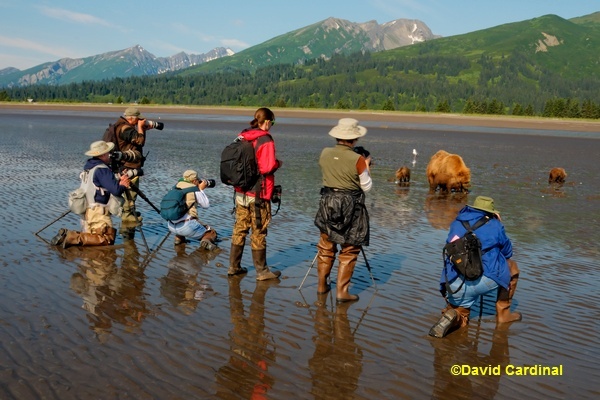 We should also have some great opportunities both weeks to photograph clamming bears. Last year we even saw a pair of clamming Ravens--something very new and truly unusual. For non-shooting spouses or companions there are a range of other activities at the lodge, ranging from enjoying the spectacular views of the Cook Inlet to world-class Salmon and Halibut fishing as well as kayaking and boat tours of a nearby lake--which featured a nesting pair of Loons with young this year. New: the lodge has a rental Nikon 200-400mm lens & tripod for those who either don't have or don't want to travel with their long lens. It's truly a special trip so we hope to see some of you coming along with us next year! Pre-trip: Meet for dinner in Anchorage. Day 1: Morning private charter flight from convenient Lake Hood field (next to Anchorage Airport) directly to Lake Clark Park near our lodge. Weather permitting, we'll be there in time for lunch and an afternoon (and optional evening) shoot. 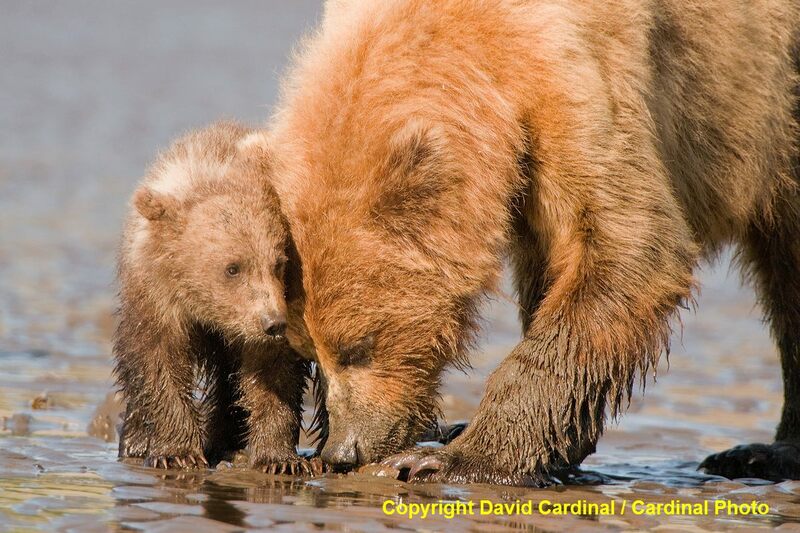 We're likely to start seeing bears from the time we land, so be ready! Days 2-6: (Days 1-5 for Week 1) 5 full days of bear photography, along with a boat trip on the lodge's own custom-built "photo-friendly" boat to visit the Puffin, Common Murre & Kittiwake rookeries. July gives us nearly unlimited shooting hours, with the brightest times mid-day providing some time for (optional) photo classes and working on images (or taking a walk, doing some impromptu fishing, or just relaxing). Day 7: (Day 6 for Week 1) After breakfast we'll pack up and head back to Anchorage, reversing our charter flight from the beginning of our trip. St. Patrick's Day Special -- $300 off if you sign up by March 20th! Price for 2018 (currently honored for 2019): Week 1: $5995 per person, Week 2: $6695 per person -- both are double occupancy, and include photo instruction, all food, lodging at Silver Salmon Creek, wine, beer, and requested soft drinks, boat trips & guiding once at the Lodge, and transportation (air charter) from Anchorage to and from the Lodge. Note: Hotel room in Anchorage for the first night is on your own, or we can book it for you and pass along the additional cost. Spouses welcome! $250 discount for a spouse or companion. Single supplement $1000 when available ($1400 for Week 2). $300 discount for a non-shooting companion. Black Friday Special -- $300 off if you sign up by November 30! visiting our secure online store, or give us a call at (650) 851-8350!